Support inquiry from Brazito Orchard Services, October 23rd, 2017. Questions about using spectral signatures to identify nutrient deficiencies are common in our support inbox. Deficiencies can cause major damage to plant growth, and as a result, are one of the most difficult things a grower must manage throughout the season. As proponents of drone mapping and multispectral sensing, we would love to say YES, spectral signatures are dependable ways to spot nutrient deficiencies. However, the issue is much more complex. In this article, we use a customer example to highlight key points about spectral signatures and how they can realistically be used in agriculture. 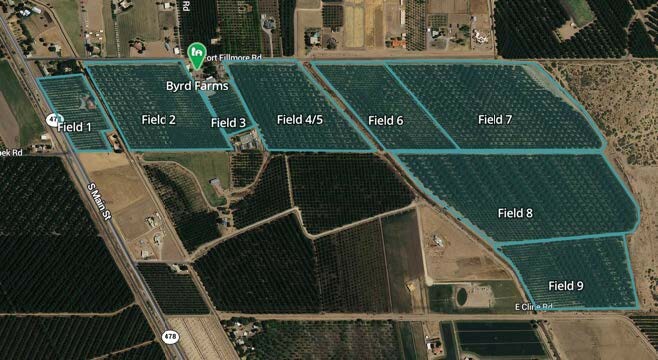 In October 2017, Brazito Orchard Services, an agricultural service provider based in Mesilla Park, New Mexico, was contracted to fly a 3DR Solo equipped with a MicaSense RedEdge over a pecan orchard in Southern New Mexico. After analyzing the imagery, Brazito staff identified multiple areas of stressed vegetation (using the Color Infrared layer). CIR composite of field 3 showing the affected areas of the field (1,2,3,4) and a healthy area (5) for comparison. Guided by the imagery, Brazito sent a group of experts from New Mexico State University to walk the field and determine the cause. Through leaf and soil sampling, the team confirmed that the stressed areas were suffering from zinc deficiency. With this diagnosis in hand, Brazito contacted the MicaSense support team to see if it was possible to identify the spectral signature of the zinc deficiency in pecans, in order to use it to enable future detection. However, before delving into Brazito’s question, its helpful to establish some context on how multispectral sensors, spectral signatures, and plant deficiencies overlap. Plants, like any other object, reflect back a portion of the light transmitted by the sun. The light reflected is known as a spectral signature, and its intensity is indicative of the health of the plant. 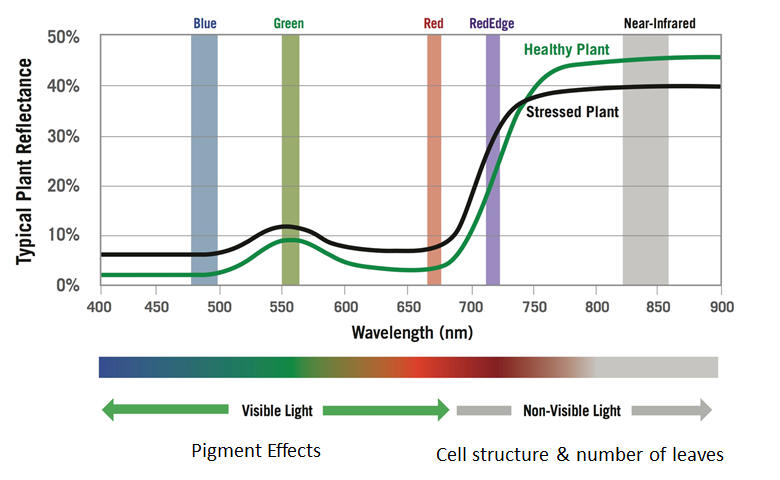 As noted in the figure above, the intensity of light reflected within the visible wavebands is controlled by leaf pigments such as chlorophyll. The intensity of light reflected in the near-infrared band is mainly controlled by leaf cellular structure. In general, a stressed plant will have a higher reflectance in the visible wavebands and lower reflectance in the near-infrared band (when compared to a healthy plant). While plants may respond to some stressors differently, they typically react in a similar way: they decrease chlorophyll and produce lower quality foliage. Therefore, water stress, heat stress, or nutrient stress may produce similar symptoms. This means that oftentimes the spectral signature of stressed plants will look the same regardless of the cause. 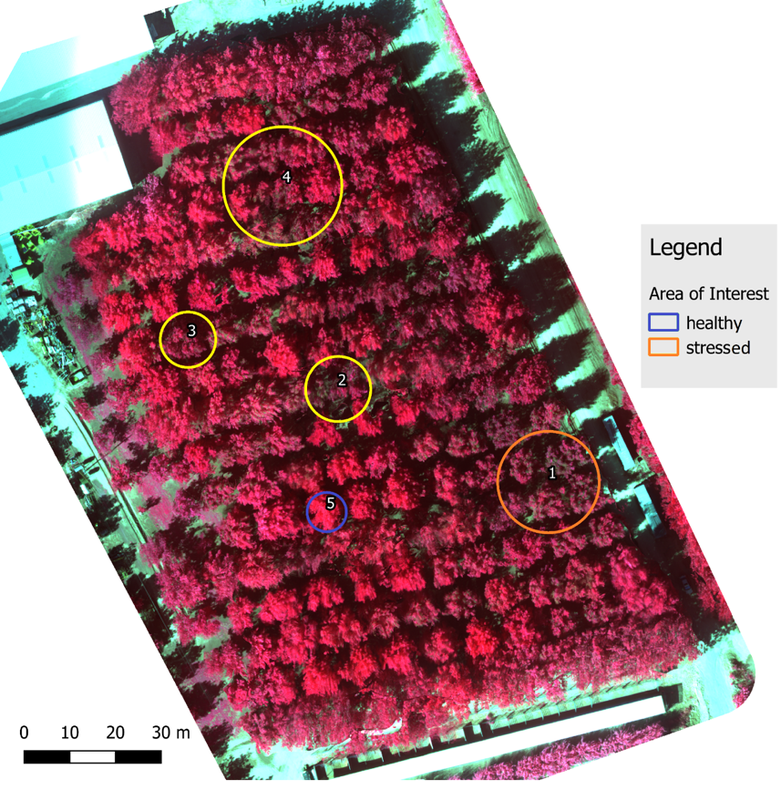 Multispectral cameras like RedEdge are designed to detect symptoms (low chlorophyll content, less foliage) based on the amount of light reflected in the different bands, but don’t necessarily pinpoint the cause behind the symptoms. Thus, to obtain a precise diagnosis, it is important to correlate multispectral imagery with other analysis and samples. So, can a unique spectral signature be used to identify zinc deficiencies? Unfortunately, the answer is no. Unique spectral signatures are not a “silver bullet” for detecting issues in the field. The spectral signature of a stressed plant will look nearly identical to the spectral signature of another stressed plant, even if they are suffering from different issues. Multispectral cameras capture spectral signatures much like a thermometer measures the temperature of the human body: a high temperature can indicate illness, but not the cause behind it. Similarly, changes in plant reflectance indicate stress, but additional information is required to identify the cause. Rather than relying solely on spectral signatures, Brazito made a sound choice by bringing in a group of experts to scout and take samples, allowing the imagery to guide their efforts. To view the different vegetative indices available in Atlas, check out our example data set. If you have a case study with RedEdge, Sequoia, or Atlas that you would like to showcase, please send us an email here.